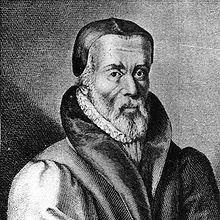 William Tyndale (c. 1494 – 1536) was a Protestant Reformer, who was the first to translate a large portion of the Bible into English, against the will of the established church and king. For his loyal defiance, he was strangled to death and burned at the stake. But his martyrdom bore much fruit, because the same king who ordered his execution (Henry VIII) commissioned the publishing of English Bibles. This eventually led to the Authorized King James version, more than three quarters of which is estimated to be Tyndale's work. You can read more about this powerful instrument of God at Wikipedia. But what did Tyndale and so many others sacrifice their very lives for? "For the preaching of the cross is to them that perish foolishness; but unto us which are saved it is the power of God" (1 Cor. 1:18). He died because he believed in the transforming power of God, and in His Holy Word, which he wanted everyone to be able to read for themselves. Until Tyndale's time, the church leadership believed that the Bible could only be translated into Latin and that only clergy had the right to read it. But this led to horrendous abuses of power and gross misinterpretations. How quickly man put himself in God's place! But if Jesus Christ bought each one of us all-access backstage passes to the Holy of Holies – to God Himself – then it stands to reason that He gave us all the right to read His precious Word for ourselves. But why is that important? What am I getting at? "For we have not followed cunningly devised fables, when we made known unto you the power and coming of our Lord Jesus Christ, but were eyewitnesses of his majesty. For he received from God the Father honour and glory, when there came such a voice to him from the excellent glory, This is my beloved Son, in whom I am well pleased. And this voice which came from heaven we heard, when we were with him in the holy mount. We have also a more sure word of prophecy; whereunto ye do well that ye take heed, as unto a light that shineth in a dark place, until the day dawn, and the day star arise in your hearts: Knowing this first, that no prophecy of the scripture is of any private interpretation. For the prophecy came not in old time by the will of man: but holy men of God spake as they were moved by the Holy Ghost" (2 Peter 1:16-21). The Bible is not just another book, but the inspired Word of God, our Lord and Creator. Its contents come with a surety and factuality unmatched in any other written work today. Scoffers may scoff, but that does not diminish its credibility. Is the sky any less blue, if I rant and rave 24/7 about how green it is?? "For the word of God is quick, and powerful, and sharper than any twoedged sword, piercing even to the dividing asunder of soul and spirit, and of the joints and marrow, and is a discerner of the thoughts and intents of the heart" (Heb. 4:12). In old English, "quick" meant "alive." The Word of God, whether spoken or written, is unique in the world and even has supernatural properties. So how do we unlock its power? By faith and by "eating" the Word, internalizing it, until we understand what it means and can apply it in our lives. P.S. Yes, I am back to blogging, for at least a while! I've been very blessed with a new job and plenty of things to keep me busy, which is why I've been away. I will try to keep this and my other blogs fresher, as well as stop by your blogs and comment.